Our current timetable hosts a wide variety of classes in varying styles and difficulty levels. 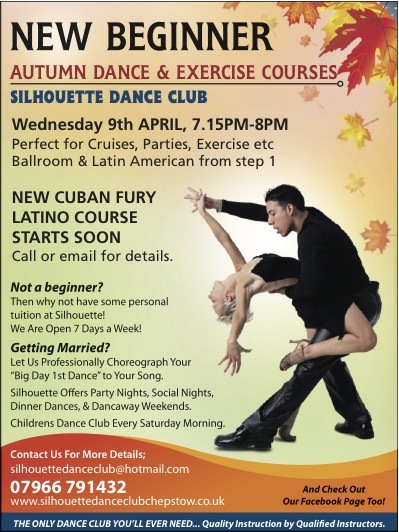 Silhouette Dance Club takes pride in the eclectic mix of dance tuition that is on offer. Styles currently incorporated includeBallroom, Latin American, Salsa, Rock n’ Roll & Tango Argentino. Tuition is offered to all ages (children to adults) and all levels of ability (beginners to those more advanced). Classes run on a weekly basis, each with their own ability level and focus. For more information on class suitability, contact us on 01291 621804 or use the contact form. Adult classes are run Monday to Friday. For details on times, please email for more information. Children’s dance club operates every Saturday morning from 10.00am. Suitable for youths aged between 3 and teens. For more details on our youth classes, click here. Getting Married? Why not have your first dance choreographed combined with a series of 1-2-1 lessons to perfect your moves. Personal Tuition is designed to focus your learning at your speed and to your needs. Lessons will be tailored and arranged to suit your time frame. Monthly Socials and Dance Weekends allow you to socialise and enjoy dance with the other members of Silhouette Dance Club. This is fun opportunity to practice your new moves with friends, and dance the night away! We really do cater for all abilities, call us on 01291 621804 or click here to contact us to find out more.